Okay – raise your hand if you’ve ever made a jar full of popsicle sticks with your students’ names on them. Yup, thought so! We all have, right? It’s a good thing because it keeps things fair and keeps us from calling on the same students all the time. Oh, and those kids KNOW that when you pick up that jar, they all have to be paying attention because you might just pull their stick. I love that! Why not take it to the next level and add a little tech? There are several sites that allow you to enter your students’ names and then the computer picks the victim (I mean student.) All of these sites work pretty much the same way, and after you enter the names your work is done. (Most of the sites have a way for you to save the list so that you don’t have to enter them each time you want to use it.) When you have any of these sites projected on to a whiteboard or SmartBoard, you’ll see that the kids REALLY pay attention! 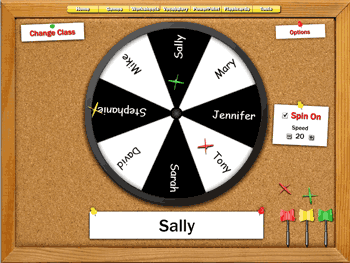 You can make it even more engaging by having students take turns being ‘the picker’ or pushing that GO/SPIN/CHOOSE button (this works especially well on a SmartBoard!) There are many of these randomizers out there, but I’ve found a few that I think work especially well for primary schools. Dart Board Selector – You do have to sign up for an account, but it’s free. The fact that you have an account means that your names save automatically. It is just SO fun to throw darts at that spinning dart board! 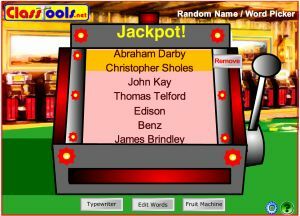 Random Name/Word Picker from ClassTools looks like a slot machine. They call it ‘fruit machine’ instead, which is pretty cute. What I REALLY love about this one is that it gave me a new idea: I could put WORDS in there. Try putting a list of your Reading vocab words in there and calling on students to use them in sentences, draw them, or act them out. Put adjectives in and have students call out synonyms or antonyms for selected words. Put Spanish vocabulary words in there and have students write down the corresponding word in English. There are a lot of creative ideas for this, so if you think of any, please share them in the comments here, on Twitter, or on Facebook! Great list of tools – thanks for sharing these. And…if you’re using a SMART Board, and the SMART Notebook software, use the Random Word Chooser from the Lesson Activity Toolkit. Not as glamorous as the ones you’ve pointed out online but a good option since it can be available for use without an Internet connection.